The CARON Collection is a manufacturer of threads for needlepoint, cross stitch, crochet, embroidery, knitting, hardangar, crazy quilting, lacemaking, crafts, and other forms of needlework. We offer hand-dyed variegated threads in two weights of cotton, in silk, and in a 50% wool, 50% silk blend. Our threads provide a distinctive flair that have made them the preferred threads of designers around the world. We also offer solid color threads in hundreds of tantalizing shades and a full line of specialty and novelty threads to compliment our hand dyed variegated thread line. Our charted designs and handpainted needlepoint canvases offer classic elegance and innovative uses for our threads. Dyed and Gone to Heaven, by The Caron Collection, is an online magazine and resource for needleworkers. 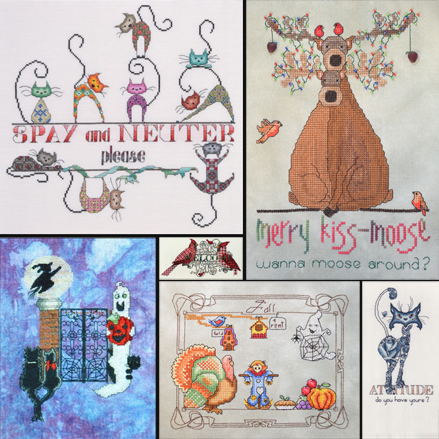 We offer you the inspiration of other designers, along with free online classes and patterns to explore the joys and wonders of all kinds of needlework. You’ll find the tools you need to help you develop your creativity and to create your own masterpieces. The Caron Collection has been the recipient of dozens of awards. Browse through our ARCHIVES for hundreds of resources and free needlework patterns. From our neighbor to the north comes Maria Gollek of MarNic Designs as our Featured Designer. Her style can best be described as whimsical. Many of her designs include text and have a message for the viewer. Our feature on Maria introduces our visitors to a very talented designer who has created her own style that can easily be recognized. Our interview with Maria includes how she got started in needlework, where she gets her inspiration from and information on where she teaches. Along with the interview is a gallery of her designs which is sure to provide inspiration to our visitors. We hope you enjoy the Spotlight. They're here. Luscious new Watercolor threads – 16 new colors to spice up your needlework. Choose from the earthy tones in Sedona Sunset or the vibrant hues in Turquose Trail. Work with the suble shades in Petal, Artic Frost, Chardonnay and Marshmallow. Add pizzazz with Prickly Pair or Rapunzel. Alphabetical & Numerical Thread Listings, Too! Print out these convenient PDF files to make it easy to purchase your CARON Collection Threads. Variegated threads can add a whole new dimension to your needlework. Maria Gollek, of MarNic Designs, has been using CARON Collections threads and has mastered using them. In this special online class Maria shows our visitors, how with various stitches, one can create spectacular effects using the CARON Collection's variegated threads. The same thread, as show above, when using a different stitch can look entirely different. By doing this class you, too, can learn how to make the most of the CARON Collection's variegated threads and incorporate them into your needlework. Calling All Shops & Designers! Want to be Proflied on the CARON Collection Site? If you are a shop that sells CARON Collection threads or a designer that uses them we'd love to Spotlight you on our website. The CARON Collection has help launch a number of careers by profiing talented designers. We've helped shops by introducing new customers to them, too. If you have an idea for an article, or have a kid's projec that you'd like to share with our visitors. We'd love to post those, too. Browse our Designer Spotlights and Shop Visits to get an idea of what we can do for you. The process is simple. Email us with your contact information and we will send out a packet of what our requirements are. We hope to see you on the CARON site!